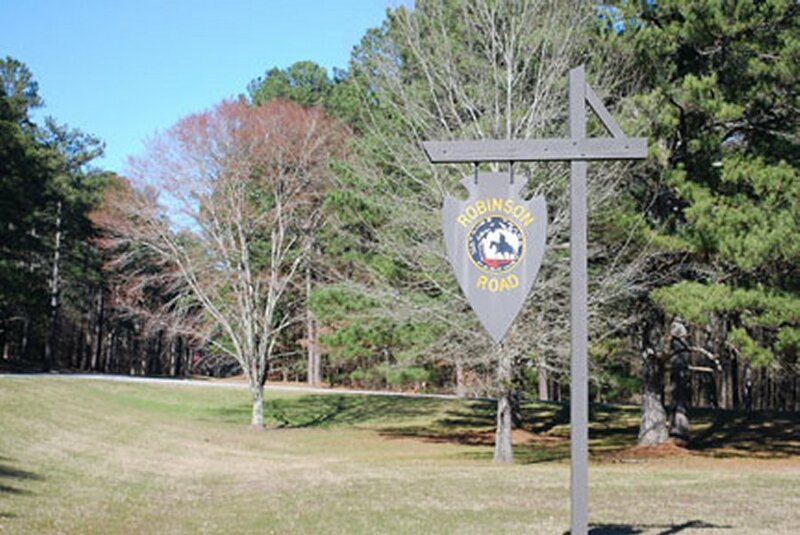 We leave Ratiff Ferry RV Park and continue north on the Natchez Trace Parkway checking out the exhibits and trails along the way. 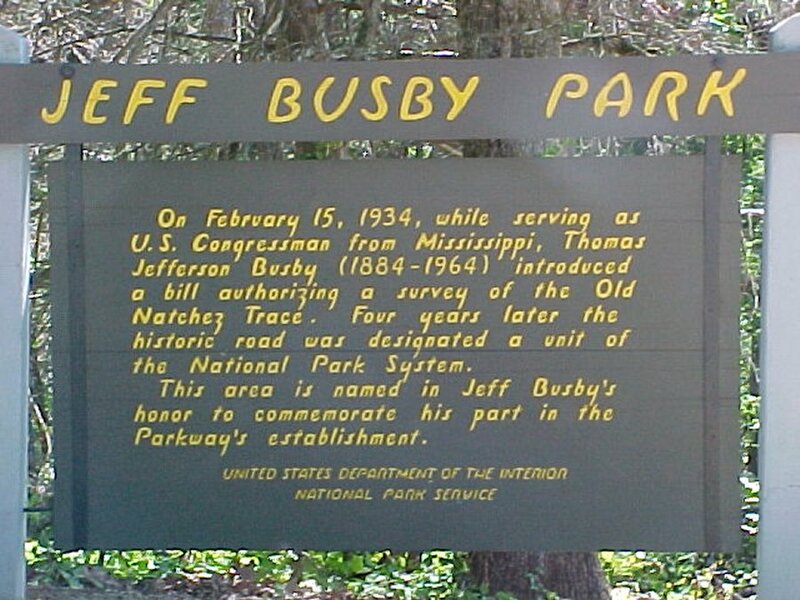 We traveled about 75 miles today ending up in the National Park campground called Jeff Busby Park. The National Park campgrounds along the Trace are free so we stayed here two nights. To view any picture on a larger scale just click on it. Then click your browsers back button to return. 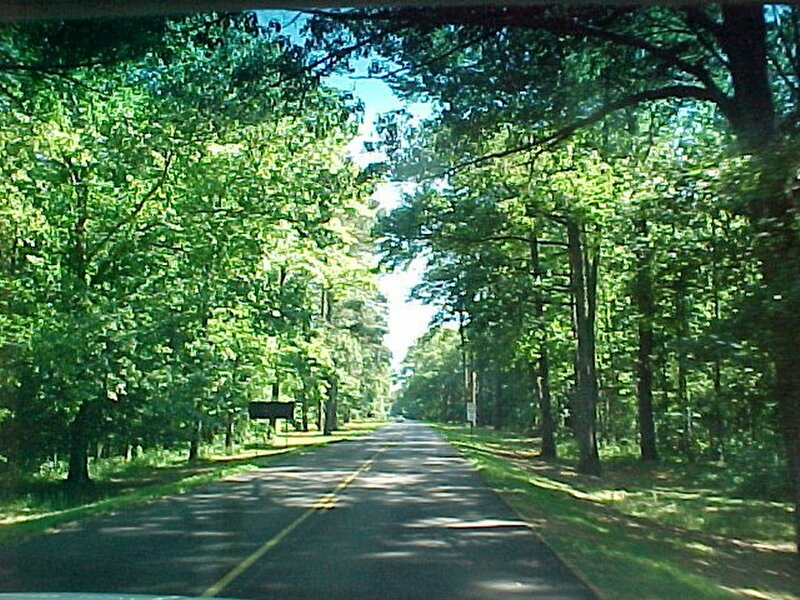 The road leaving the RV park. 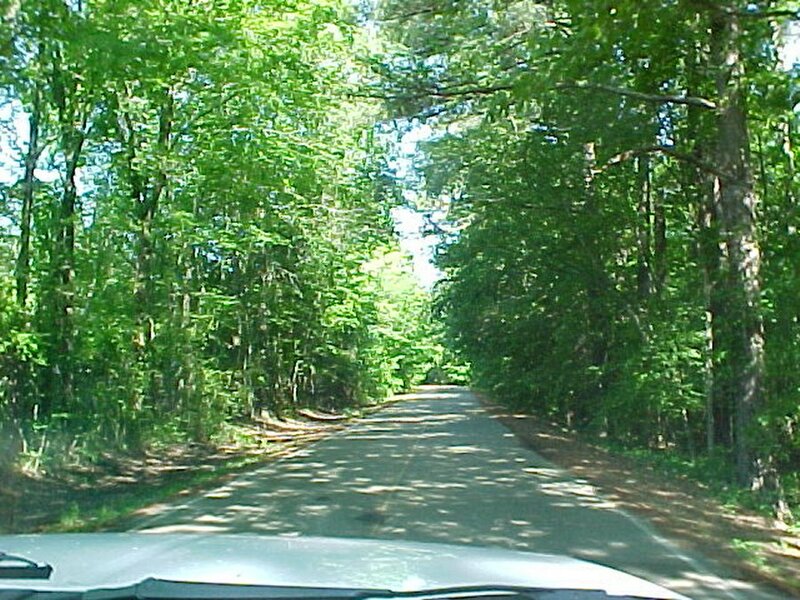 Back on the Natchez Trace Parkway, we stopped at more exhibits and nature trails. The Treaty of Doak's Stand (7 Stat. 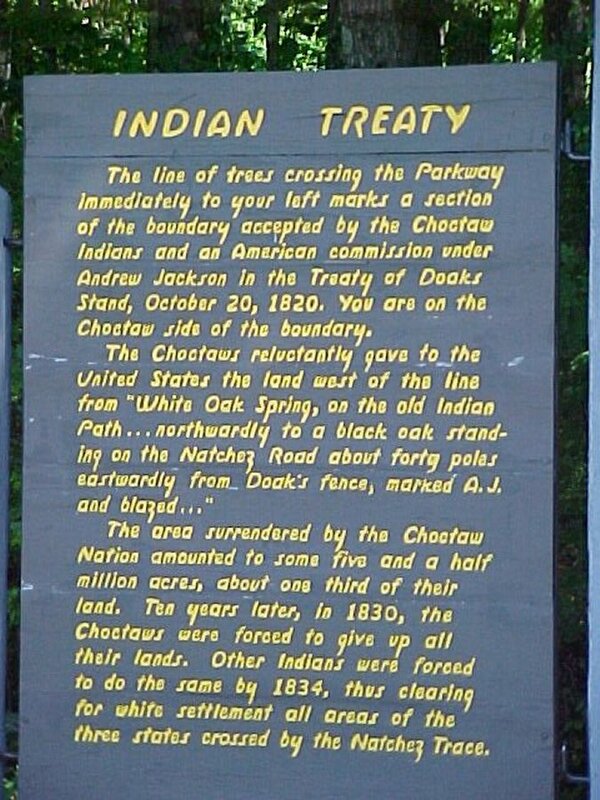 210, also known as Treaty with the Choctaw) was signed on October 18, 1820 (proclaimed on January 8, 1821) between the United States and the Choctaw Indian tribe. 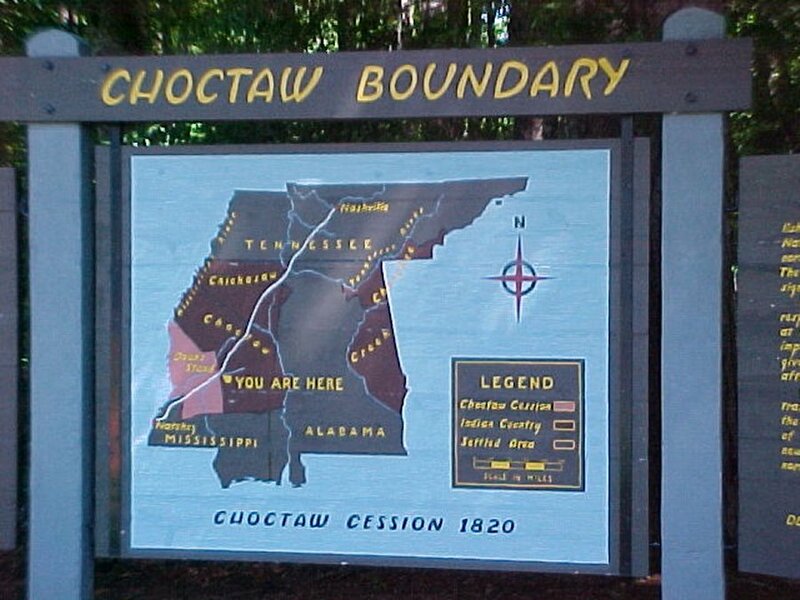 Based on the terms of the accord, the Choctaw agreed to give up approximately one-half of their remaining Choctaw homeland. In October 1820, Andrew Jackson and Thomas HindsThomas were sent as commissioners that represented the United States to conduct a treaty that would surrender a portion of Choctaw country in Mississippi. The convention began on October 10 with a talk by Sharp Knife, the nickname of Jackson, to more than 500 Choctaws. 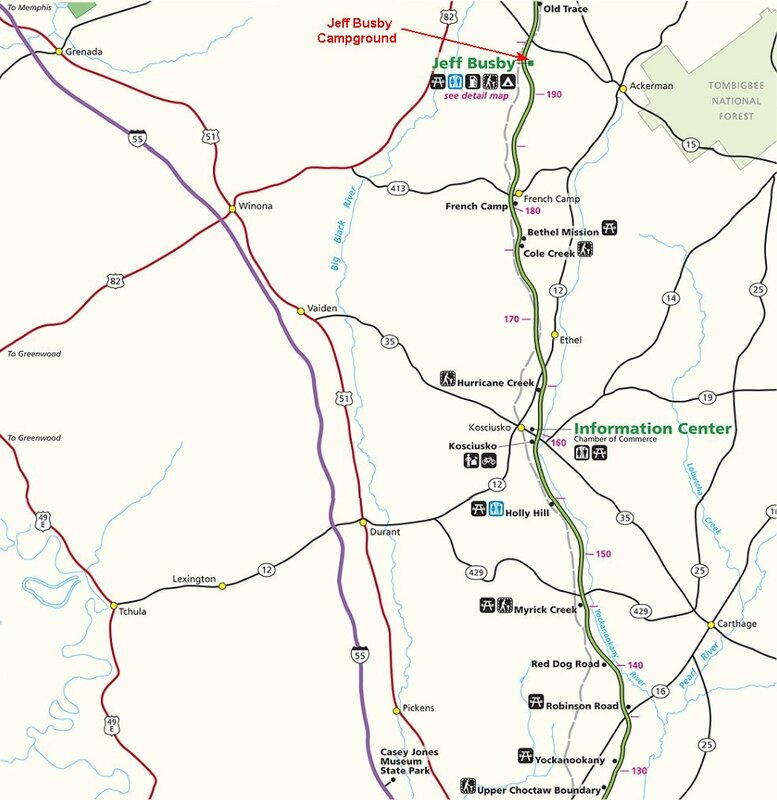 Pushmataha accused Jackson of deceiving them of the quality of land west of the Mississippi. Pushmataha responded to Jackson's retort with "I know the country well ... The grass is everywhere very short ... There are but few beavers, and the honey and fruit are rare things." Jackson finally resorted to threats to pressure the Choctaw to sign a treaty. He shouted "Many of your nation are already beyond the Mississippi, and others are every year removing .... If you refuse ... the nation will be destroyed." On October 18 the treaty was signed. 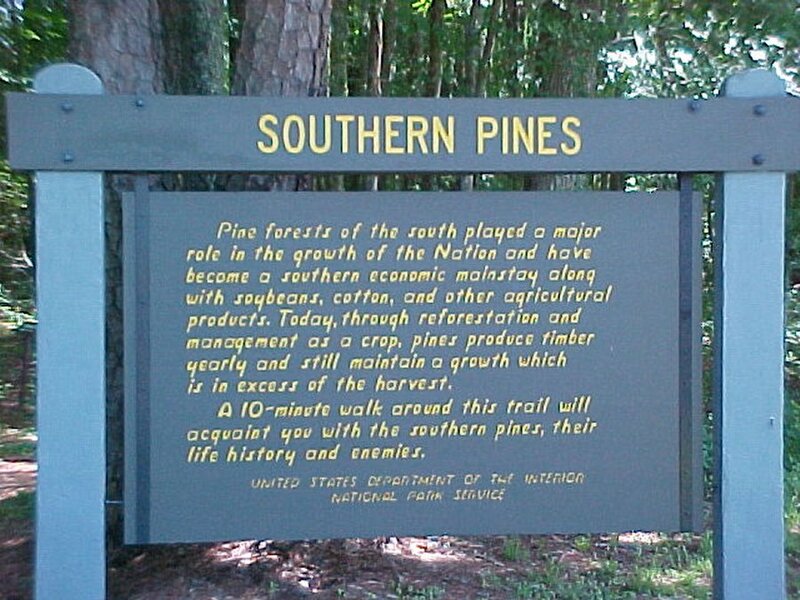 Our 20 minute walk on the southern pine trail. 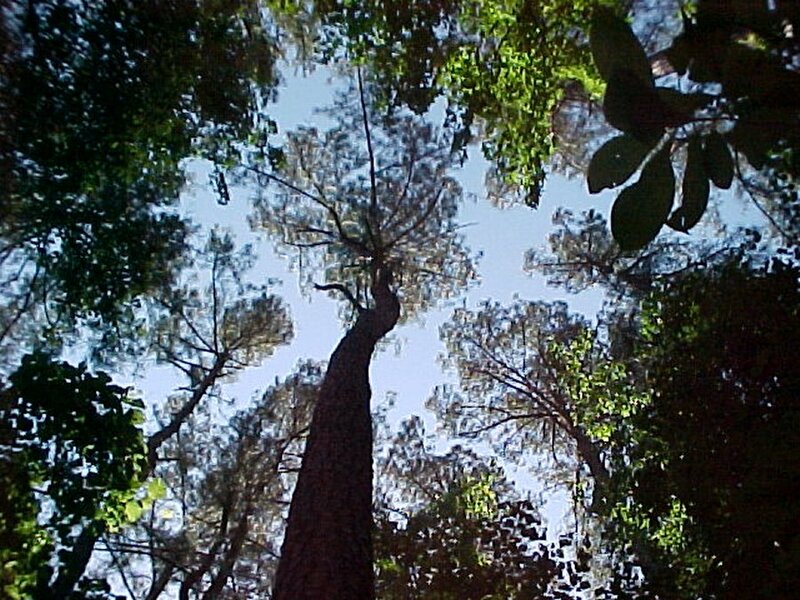 This pine tree is approximately 90 years old (1975), is 19 inches in diameter and 80 feet tall. It would produce enough paper to print 350 books of 550 pages. 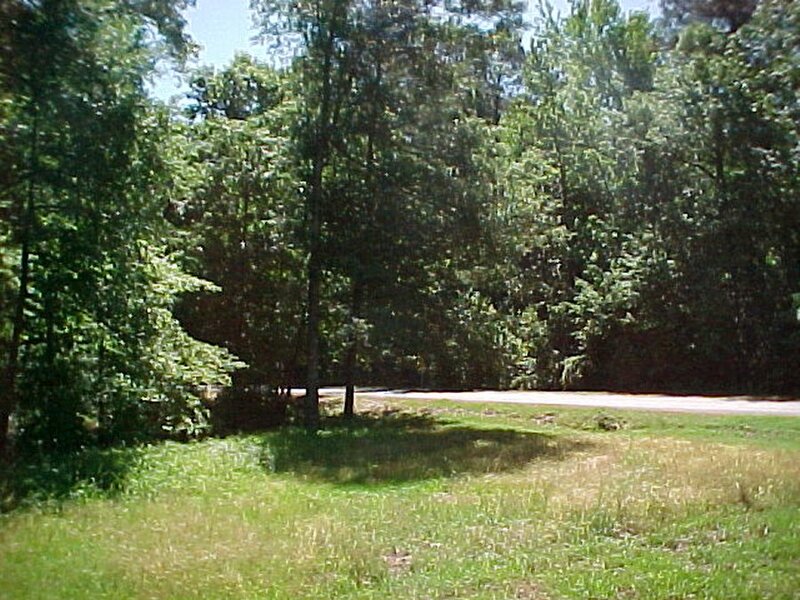 Robinson Road was built in 1821. 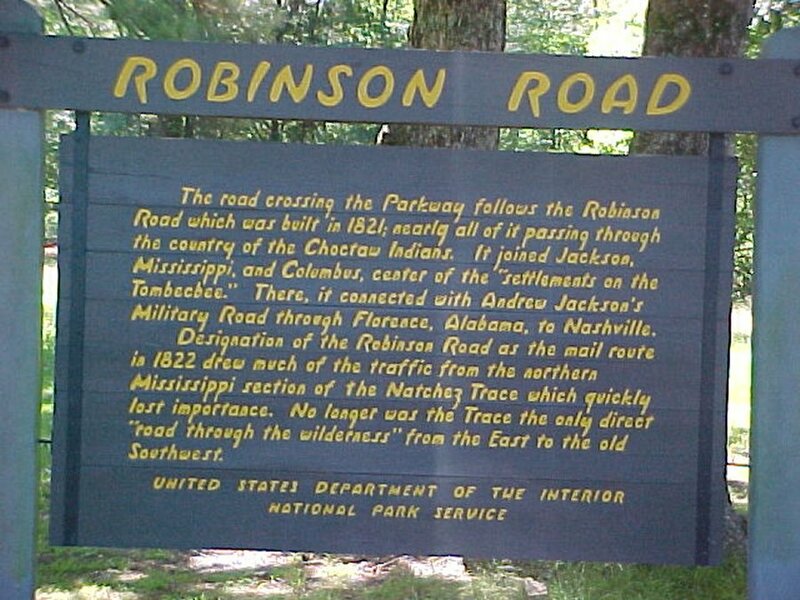 Designation of the Robinson Road as the mail route in 1822, drew much of the traffic from the northern Mississippi section of the Natchez Trace. No longer was the Trace the only direct road through the wilderness from the east to the old southwest. In the 1820's Robinson Road crossed here. 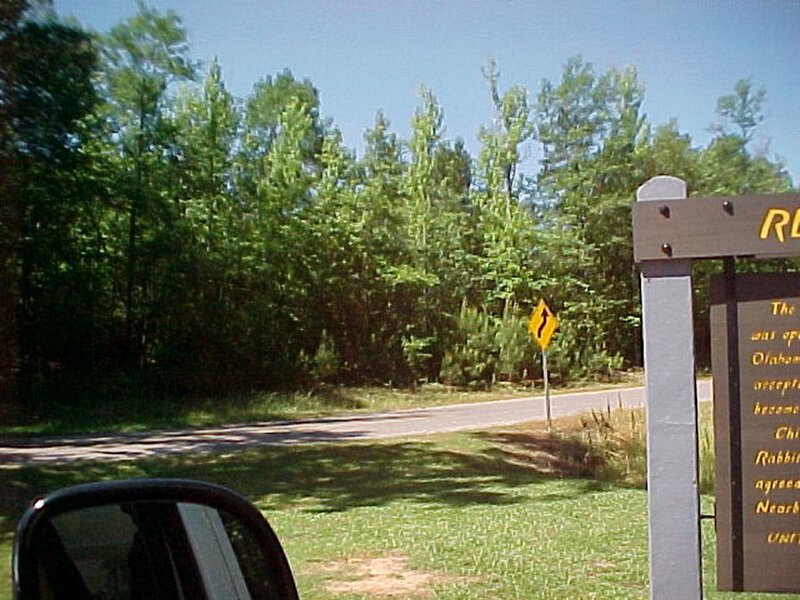 Robinson Road Milepost marker 136. 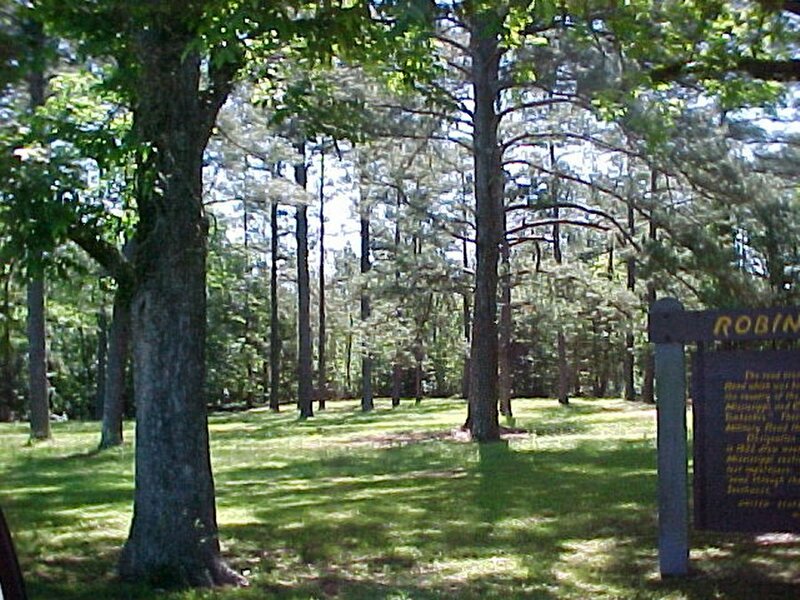 About 5 miles north of here on September 7,1830, the Choctaw Indians signed their last treaty with the United States,yielding most of their remaining tribal lands in Mississippi to white settlement. 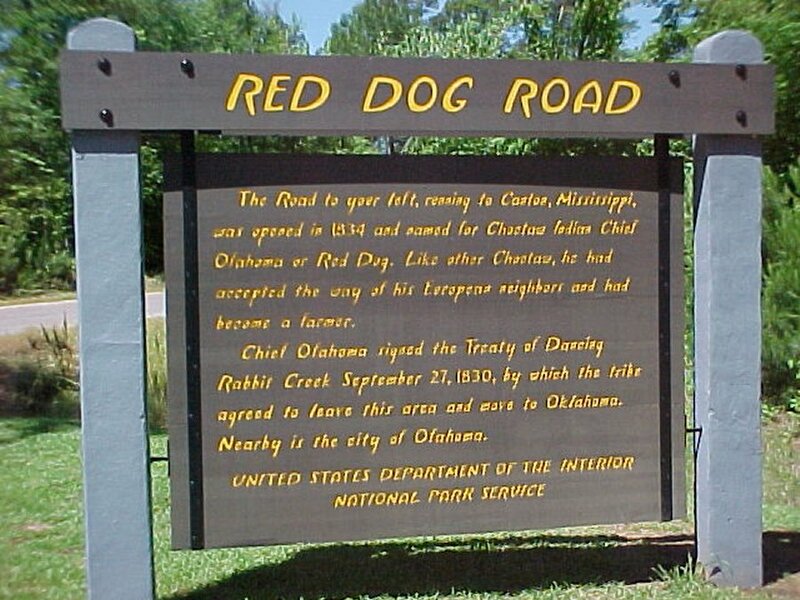 The road, running to Canton, Mississippi was opened in 1834 and named for a Choctaw Indian, Ofahoma, or Red Dog. Like other Choctaw, he had accepted the ways of his palefaced neighbors and had become a farmer. Red Dog, an important chief, was one of the signers of the treaty of Dancing Rabbit in 1830, by which the tribe agreed to move to Oklahoma. 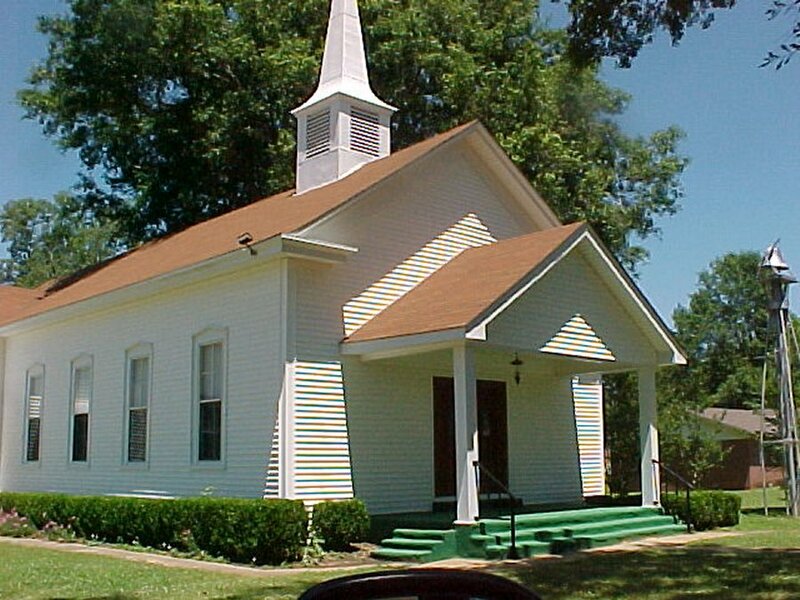 Nearby is the community of Ofahoma which for many years had a U.S. Post Office. Red dog (Indian chief) road. The road was closed for repair. Self-guiding trail. Allow 15 minutes to walk in area that identifies plants found in different soil conditions. 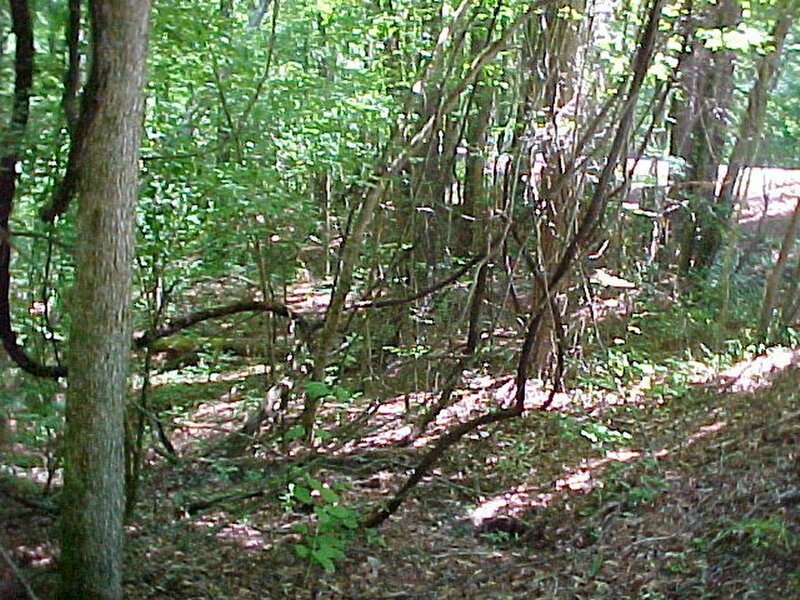 The trail descends to the vegetation that thrives in the wet bottomland along Hurricane Creek. 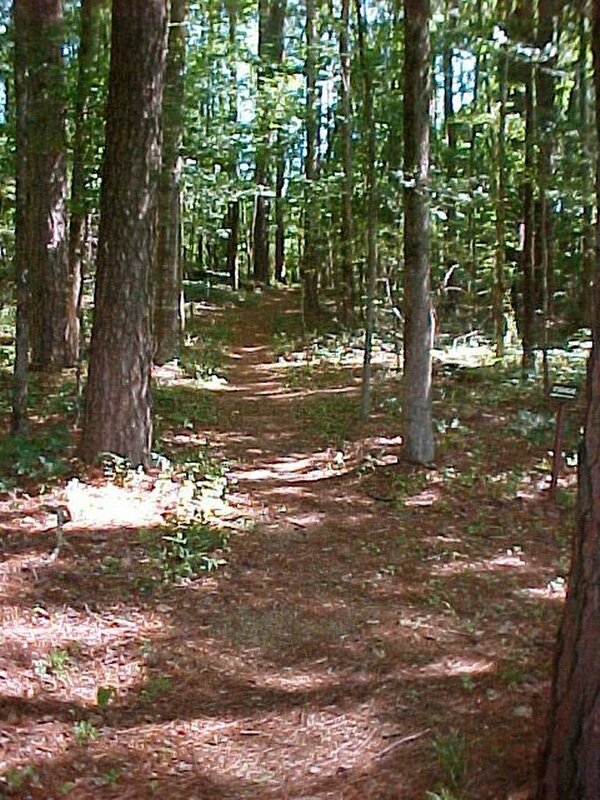 The path winds upward among plants growing in soil of medium dampness and on to the top of a dry hill before returning. 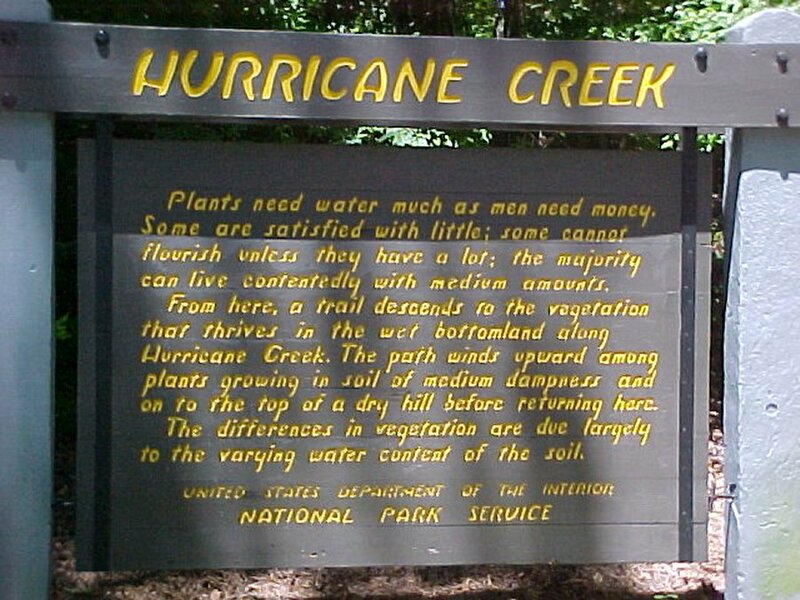 We hiked the trail along Hurricane Creek. 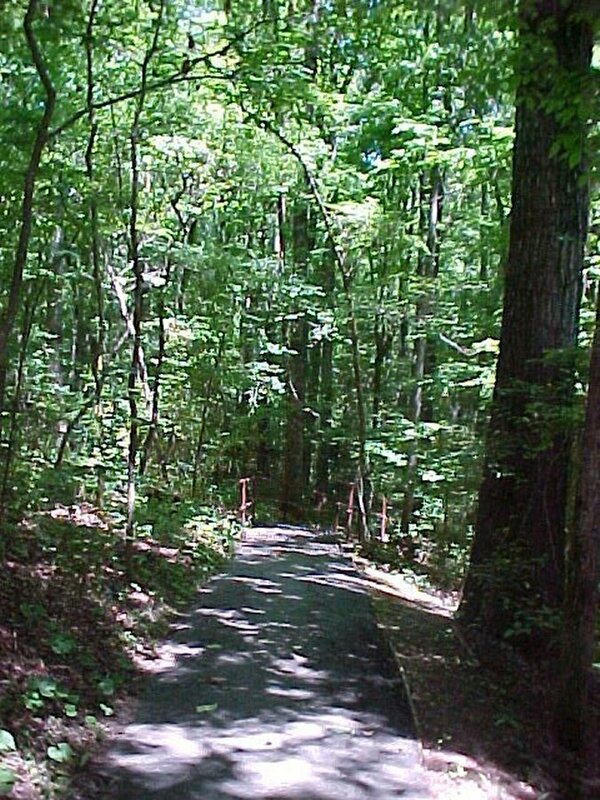 The trail goes up from the creek and tells what kind of trees grow in different elevations. 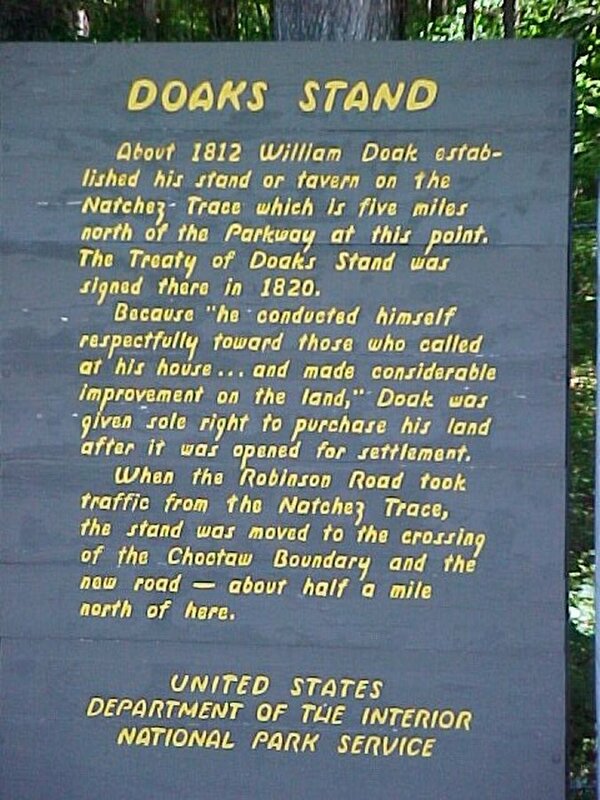 A French trader set up shop on the Natchez Trace to do business with the Choctaw Nation and also anyone traveling the old Trace. From the "Frenchman's Camp" has grown the town of French Camp. Most of the town is now a Christian boarding school. 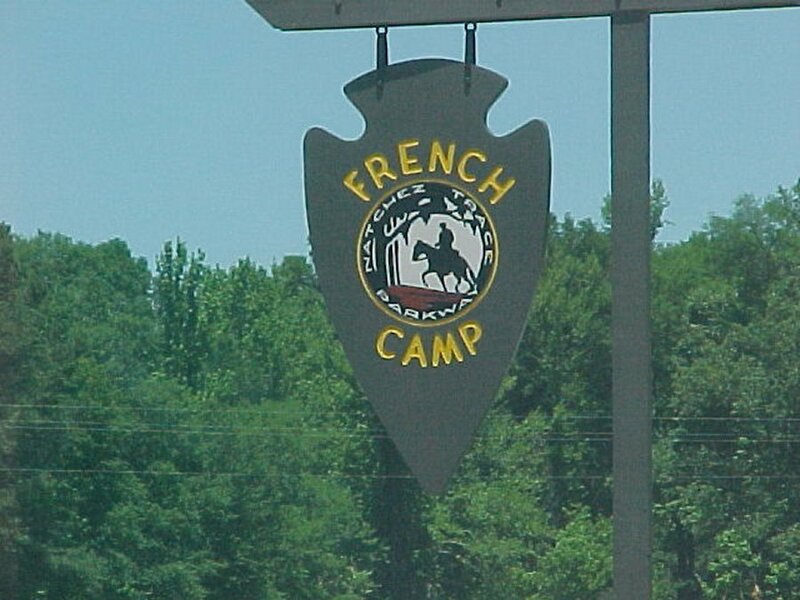 French Camp has many sites to see for folks traveling down the Trace. 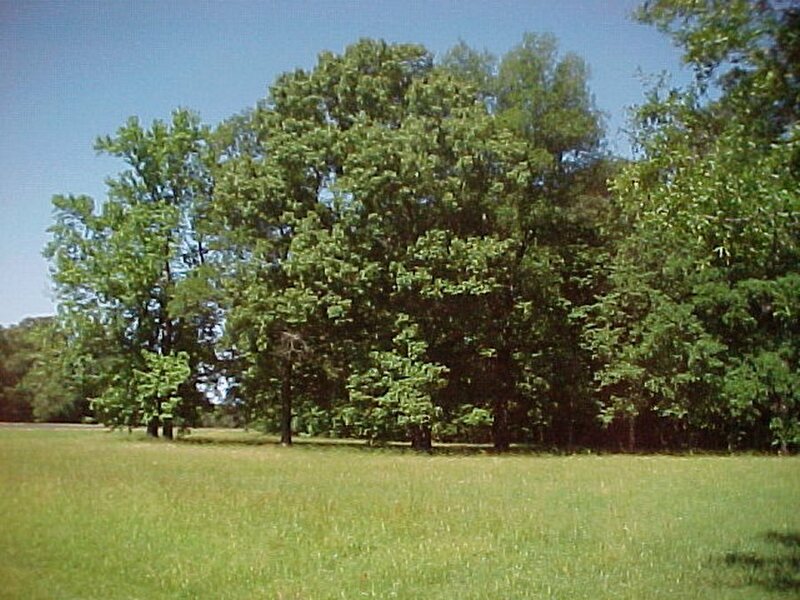 You can stay the night in the only Bed & Breakfast on the Natchez Trace. 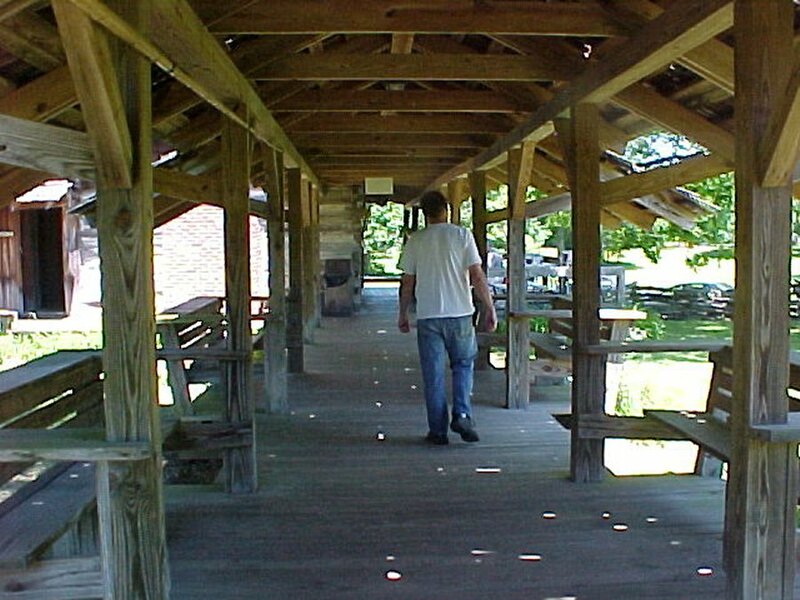 You can also discover early American life by walking through the 19th century style farm house to see how a Revolutionary War soldier lived. See how handmade quilts are stitched together piece by piece. If you are hungry stop in for homemade sandwiches and soups (yes we are) which are made six days a week in the Council House Cafe'. 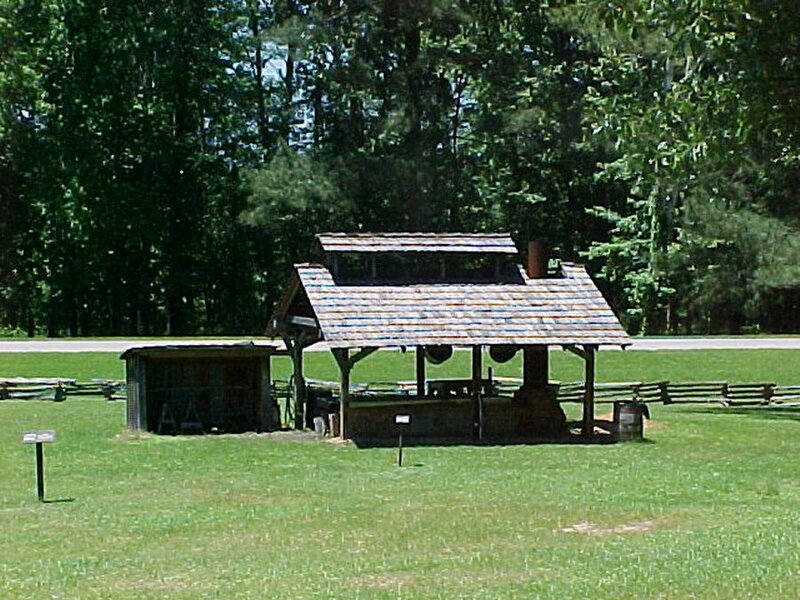 Or if you stop by on a Saturday in October Sorghum Molasses is cooked the old fashioned way at the historic village. Sign for French Camp. We ate lunch here served by a waitress from the boarding school. 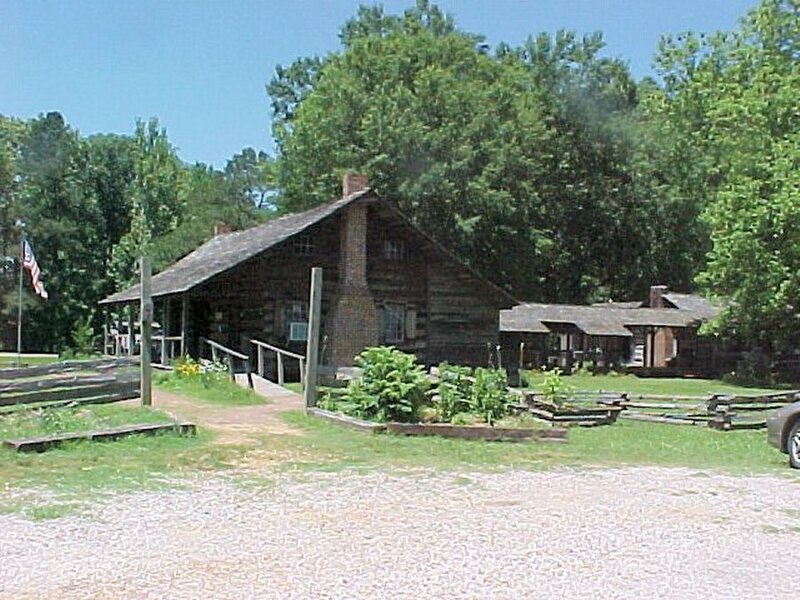 French Camp information center, cafe and 19th century style farm house. This is the Sorghum mill is used ever fall to make molasses from cane. David is heading toward the cafe.There is a cute blond with the cutest southern accent. 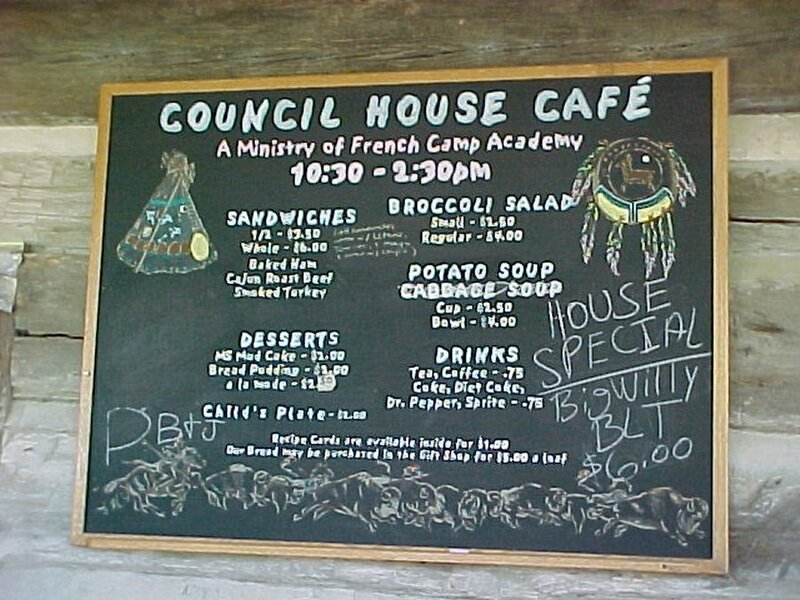 This was the French Camp council house, now a cafe. We ate lunch here, Sandwiches are big and great. 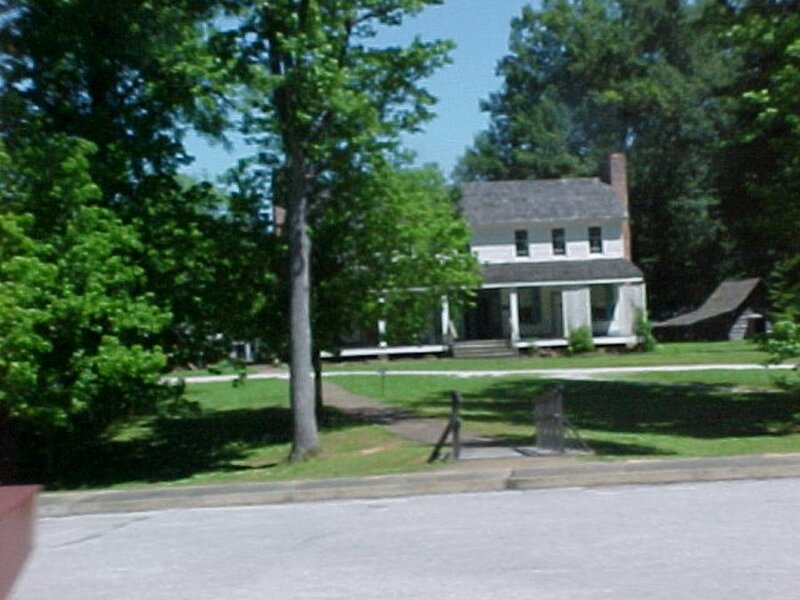 Col. James Drane's house at French Camp. We stopped at Jeff Busby park and stayed two nights. The campground here is free. 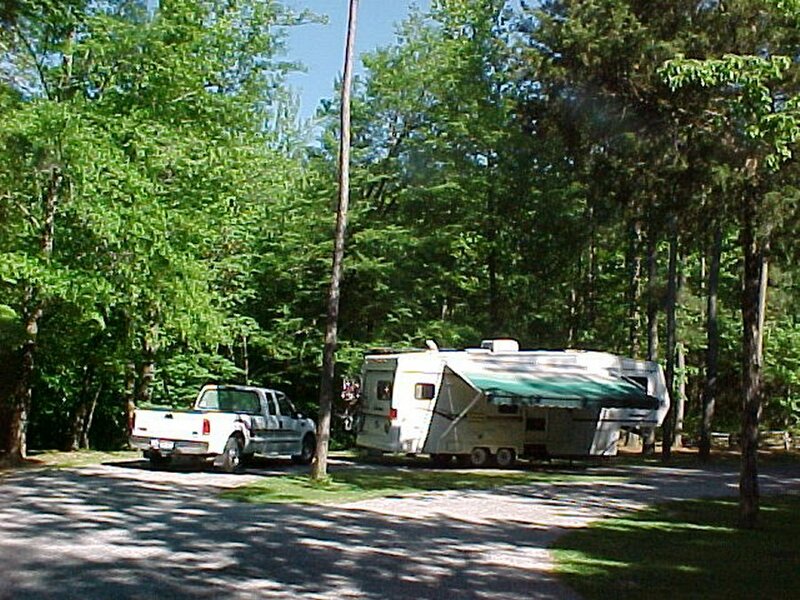 Our camp site at Jeff Busby Campground.